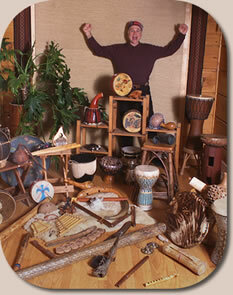 Bill Kehl - Planetary Productions, Ltd: Earth, Music... Magic! A virtual "moving museum" of primitive musical instruments. An animated and innovative approach to learning about our world of wonder and the creative discovery of musical instruments. An interactive and engaging musical performance celebrating the incredible beauty and diversity of the natural world and its inhabitants. An integrated educational program enthusiastically emphasizing the positive aspects of responsible stewardship and personal empowerment. School assembly programs, residencies and special events days. Children's library programs and adult community outreach events. Youth groups and leadership conferences. Nature and environmental education centers. Day camps, summer camps, church camps and recreation programs. Independent living and assisted care facilities. "Outstanding program... the kids could have listened all day!" "Your message came ringing through... well planned and very good awareness of audience needs." "Very entertaining... informative for both students and teachers alike." "Your concern and enthusiasm were enjoyed and greatly appreciated." "Thanks again for helping make our event a success...you were a big hit with people of all ages!" "Your presentations have been outstanding... feedback from staff and students has been fantastic!" "Best program we've ever had in our school!" "What a terrific presentation... several hundred students in the gym and you could have heard a pin drop." $225 per program 45–75 minutes in length. $325 per half day session or 2 programs in same location. $425 per whole day (6 hours) session (or 3 programs). • Half and whole day sessions can be arranged with any combination of programs, activities and age groupings. • A half day minimum is required for all locations more than 100 miles round trip from Neshkoro, WI. • A nominal travel fee will be added to all program costs. Customized presentations available upon request. PLEASE NOTE: The e-mail address published in this brochure is no longer valid. All inquiries should be sent to 1wjk@centurytel.net.